Happy Sunday! How are all of you? I am finally getting around to another edition of Catching Up with Quelle. TCM Classic Film Festival - It looks almost certain that Carlos and I will be attending the TCM Classic Film Festival in April. We have our tickets and our hotel booked. All we need is to buy plane tickets. There is still a chance we won't be able to go but it looks more certain that we will than it did before. I am excited to go, to see Hollywood, to meet a lot of classic film fans and of course to watch some great movies! New Robert Mitchum iPhone Case - Remember the Robert Mitchum iPhone case I had custom made in September? Well it broke. I have a tendency to drop my iPhone a lot. So I got a new one and am determined to not abuse my iPhone as much so I can keep this case a lot longer. Otherwise this will be an expensive new hobby of mine! I like this iPhone case better than the last one. It's a great colorful of image of Robert Mitchum's 1953 visit to Hawaii. 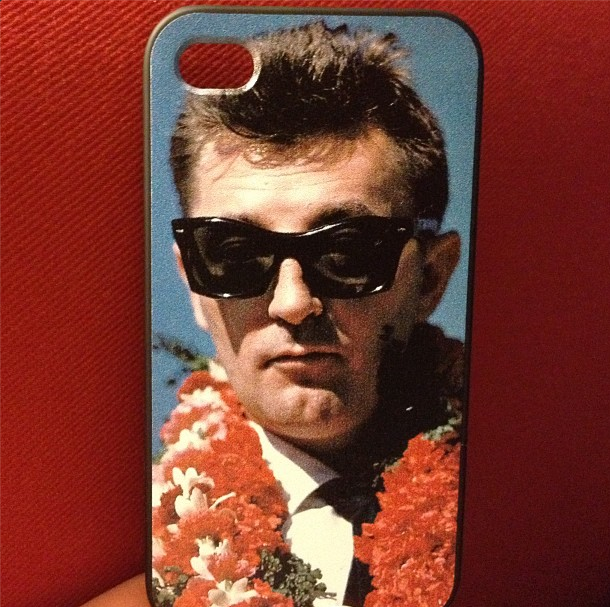 If you want to create your own custom iPhone case, I recommend using CafePress. You can get one made for $25 but I suggest you wait for a sale or a good coupon code. I ended up getting a few dollars knocked off the price with a custom iPhone case sale. Oh have fun at the TCM Film Festival, that's really exciting! And I love that goodreads list, I'm currently reading "Off With Their Heads", Frances Marion's memoir, which I would recommend to add but unfortunately it's out of print so it'd be kind of unfair to suggest it. Thanks for the goodreads list, I'll go check that out right now! Great looking iPhone case! I love the color. Have fun at the TCM fest. I may try to catch a screening here and there via the standby lines again. I can't wait to see the complete schedule. Oh, I hope you have fun at the TCMFF! The new case looks very "summerish", ideal for holidays. What a lovely letter form Sidney! Aw!